There’s so much buzz about the damaging effects of blue light on your overall health—specifically the health of your eyes—that even as an eyecare professional, a Google search of “blue light and your eyes” can be overwhelming. Blue light is nothing new, so why the sudden need to discuss it with our patients? Because we have effectively brought the sun and all its damaging blue light indoors. With the extensive use of backlit flat screen electronic devices (tvs, computers, tablets, smartphones) and fluorescent and LED lighting, most of our patients are exposed to damaging blue light from the time they open their eyes in the morning until they close them at night. This overexposure to blue light can cause a variety of health issues, from digital eye strain and migraines to insomnia and even retinal damage. High energy blue light flickers more than other wavelengths, causing intense glare that leads to eye strain and fatigue. Fighting to see through this glare for hours each day can lead to dry eyes, headaches, neck aches, and backaches. Another negative consequence of overexposure to blue light is its effect on our ability to not only fall asleep, but also to enter proper REM sleep. We rely on the natural blue light from the sun to help our bodies regulate a natural sleep and wake cycle, and also to boost our moods and energy levels. With overexposure to artificial blue light, our bodies produce less melatonin, the hormone that regulates our moods and sleep cycles, which can result in insomnia and depression. There is evidence that overexposure to blue light also contributes to retinal and macular damage, which can eventually lead to blindness. Harvard medical studies have found that blue light is the most dangerous light for the retina, and the American Macular Degeneration Foundation reports that blue light accelerates macular degeneration more than any other part of the light spectrum. 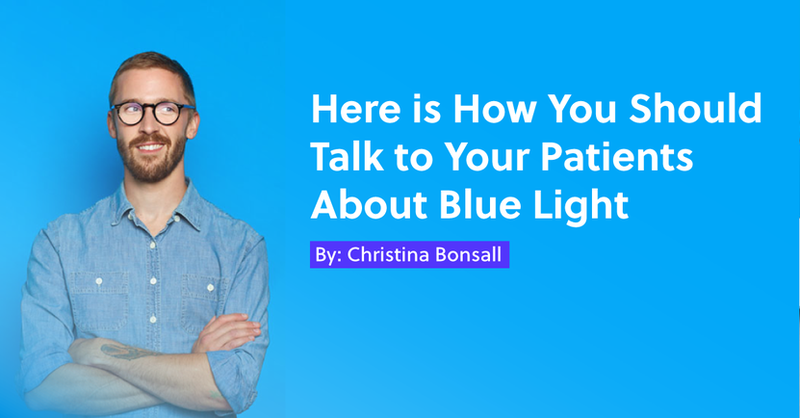 Given the wide range of damage that blue light can cause to the eyes and overall health, it is important to begin talking to your patients about protecting themselves from it. Just like it’s become the norm to talk to our patients about protecting their eyes from UV with sunglasses, we should be talking to our patients about blue light protection. There are a number of products designed to help filter or block some of this Harmful Blue Light.1 These blue-blocking and blue-filtering products are available in prescription and non-prescription lenses, so it’s easy to have blue light conversations with every patient who walks through your doors. “Given the amount of time you spend working on a computer under fluorescent lighting each day, I recommend lenses that will provide you with protection from blue light. Blue light lives next door to ultraviolet light on the light spectrum, and it damages your eyes in similar ways. UV light causes damage to the front of your eyes which leads to cataracts. Blue light reaches all the way to the back of the eyes, and can cause retinal damage that can eventually lead to blindness. With my patients, I recommend Transitions® lenses, which now have Essilor’s Smart Blue Filter™ built into them. With Essilor’s new filter, Transitions provides additional blue light protection even when the wearer is indoors. Depending on the patient’s needs and lifestyle, I may suggest that my patients upgrade from the Transitions® Signature® VII, the standard 100% UV protection, to Transitions® XTRActive®, which protects eyes from UV and increases the blue light filter up to 45%. Plus they darken in the wearer’s vehicle, making driving easier. Side note: UV and blue light control aren’t the only reasons your patients need Transitions lenses. Light/Dark adaptation is a very important aspect of photochromic lenses. Lenses that lighten and darken with changing light conditions can keep the eyes comfortable and vision at optimal performance. Of course, Transitions lenses and Eyezen+ lenses also have Smart Blue Filter™ built into the clear lens; this alone filters about 20% of blue light. Should the patient choose to rely on Smart Blue Filter™ alone to provide blue light protection, be sure and have a conversation with patient about the trade-offs of choosing a clear lense that doesn’t adapt to light or eliminate glare and reflections. As an optician, my preferred recommendation for fully protecting my patients’ vision and eye health is a lens solution containing Transitions lenses and Crizal® Prevencia® or Crizal Sapphire® 360° UV lenses. These lenses contain everything your patients need for optimum vision. A complete lens solution will provide minimal distortion while controlling blue light, UV light, and visible light, as well as controlling glare and reflections. Educating a patient on blue light and recommending an appropriate solution is simple! Try it with your patients. Even if they choose not to purchase the products, you’ve educated them on how to best protect their vision and the health of their eyes, and after all, isn’t that why we are here? Harmful Blue Light is the blue-violet wavelengths (415-455 nm) on the light spectrum that is most toxic to retinal cells.